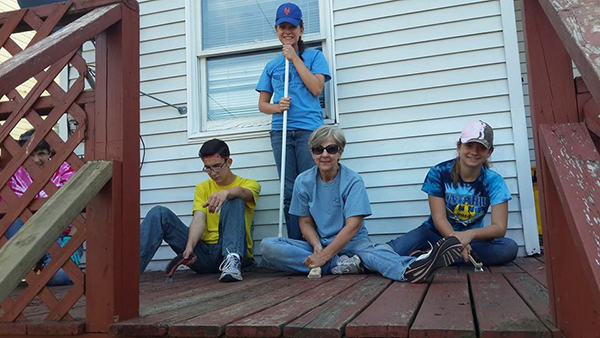 Epworth SOWER Work Mission Season: 298 participants, 70 projects, 8,000 work hours – Amazing! The Epworth Center is thankful for another wonderful Sharing Our Witness Enriching Relationships (SOWER) Work Mission season. God has blessed us with so many people who have made a real difference in our local area. As we conclude the SOWER summer, it’s amazing to look back over the numbers and statistics from the season. 298 SOWER work mission participants came from all over Ohio, Michigan, Illinois, Maryland, and even a group who flew in from Massachusetts! Many denominations were represented, such as United Methodist, Presbyterian, and Episcopal. Approximately 70 projects were completed in 13 different local communities: Bannock, Barnesville, Beallsville, Belmont, Bethesda, Centerville, Flushing, Jacobsburg, Lafferty, Maynard, St. Clairsville, Shadyside, and Wheeling. These projects included handicap accessible ramps, porches, painting, roofing, steps, underpinning, landscaping, gutters, door, cement work, restrooms, and electrical repair. One of the most amazing facts is that we estimate nearly 8,000 hours were spent working on neighbor’s homes. Eight thousand hours! That’s just SOWER participant hours – it doesn’t include all the donated hours for construction supervision, meal preparation, and more. Not only were building repairs made, but we also had one group who conducted Vacation Bible School for a local church. Other groups helped with the Summer Lunch Program and Garden SOXX vegetable planting. We were even able to partner with a local Presbyterian Church who did mission work at the local women’s shelter during their VBS. While the facts and stats appeal to some, it’s about so much more. It’s about the relationships that were built and the lives that were impacted. We can’t begin to express how heartwarming it is to receive thank you notes sharing the hope that is found in something like having a porch built. That is what it’s all about. It’s not so much about the numbers, it’s about our neighbors. It’s about those who are growing in servanthood. It’s about making disciples for the transformation of the world. It’s about serving Christ through serving others. It’s about joining God as He does something great in this world. It’s about being a beacon of light and hope to our neighbors in need. Our theme this summer was “Rebuild. Restore. Renew.” from Isaiah 61. Not only were pieces of homes “rebuilt,” but so were relationships. Hope was restored. Faith was renewed. It’s always so bittersweet at the end of a SOWER season. What a wonderful summer and what a joy and privilege it is to serve God! We will have our annual SOWER Celebration Dinner on Saturday, September 20 at 5:00 pm. The event is open to all and there will be no cost, although donations are appreciated. For more information, please visit www.epworthcenter.org or call 740-484-4705. *Dawn Livingston is executive director of Epworth Center.